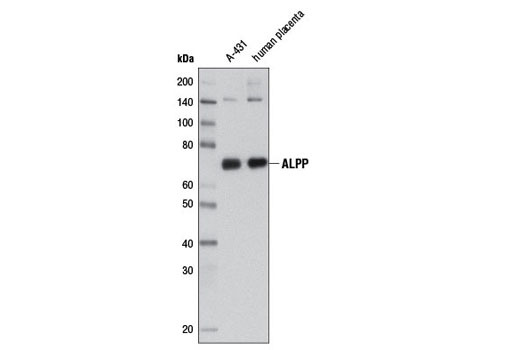 Western blot analysis of extracts from A-431 cells and human placental tissue using ALPP (3E5C7) Mouse mAb. ALPP (3E5C7) Mouse mAb recognizes endogenous levels of total ALPP protein. This antibody may cross-react with a protein of unknown origin at ~140 kDa in some cell lines. Monoclonal antibody is produced by immunizing animals with a recombinant protein fragment specific to human ALPP protein. Mammalian alkaline phosphatases (APs) are highly conserved zinc-containing allosteric enzymes that are able to hydrolyze and transphosphorylate a wide range of compounds (1). There are four known human alkaline phosphatase isozymes: TNAP (tissue-nonspecific; bone/liver/kidney), ALPP (placental), ALPP2 (germ cell), and ALPI (intestinal) (2). Placental alkaline phosphatase (ALPP) is bound to the plasma membrane via a glycosyl-phosphatidylinositol (GPI) anchor (3). It is expressed primarily in the placenta (4) and may be involved in transplacental IgG transport (5). ALPP has been found to be overexpressed on the surface of several different types of solid tumor cells (6) and elevated serum concentrations of ALPP and ALPP-like enzymes has been found to be associated with ovarian, cervical, and testicular cancer (7). Hoylaerts, M.F. et al. (1997) J Biol Chem 272, 22781-7. Millán, J.L. (2006) Purinergic Signal 2, 335-41. Low, M.G. and Saltiel, A.R. (1988) Science 239, 268-75. Beckman, G. et al. Hum Hered 45, 1-5. Fishman, L. et al. (1976) Cancer Res 36, 2268-73. Ind, T. et al. (1997) Br J Obstet Gynaecol 104, 1024-9. Koshida, K. et al. (1996) Br J Urol 77, 138-42.